Justin Jackson takes a handoff during the first half of Saturday's game against Penn State. Jackson rushed for a career-high 186 yards on the ground in the 23-21 win. In a tumultuous tale of two halves, No. 21 Northwestern (7-2, 3-2 Big Ten) kicked a field goal with nine seconds left to edge Penn State (7-3, 4-2) 23-21 at Ryan Field on Saturday. NU dominated in all three phases during the first half, despite facing a couple of controversial penalties and no-calls. After an injury took redshirt freshman Clayton Thorson out in the first quarter, back-up Zack Oliver was able to toss a clean touchdown pass and run in for a 1-yard score, facilitating drives without any turnovers. The defense both stifled the Penn State run and limited Nittany Lions quarterback Christian Hackenberg’s range. Penn State ran for only 24 yards in the first two quarters, while NU gained 140. 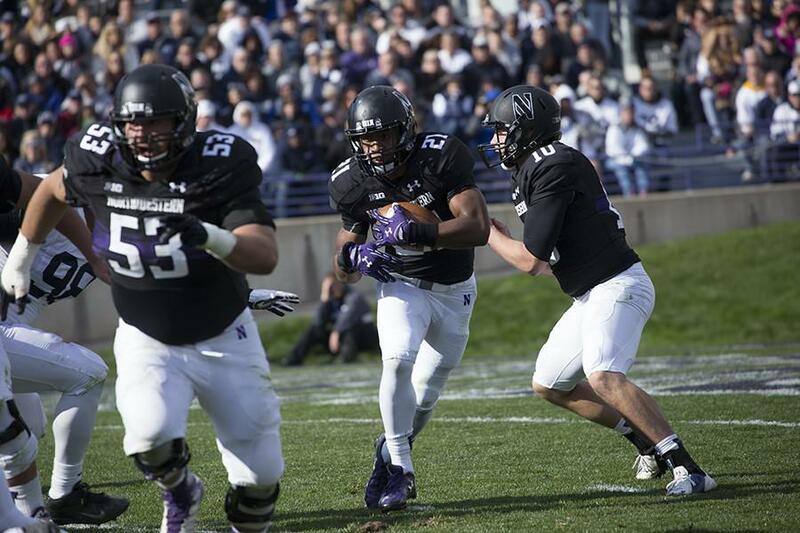 The first half also saw the return of Justin Jackson, who rushed for 85 yards in the first half. The Cats shone in the last three minutes of the game, coming up with a big defensive stop before executing a two-minute drill that set up the game-winning field goal. With Oliver at the helm, the NU offense performed under pressure and moved the ball 36 yards in just over two minutes to give junior kicker Jack Mitchell a comfortable kick. The momentum swung decidedly in Penn State’s favor after halftime. Despite a solid start, Oliver faltered badly in the second half, throwing an interception and many incompletions. Oliver went 11-for-24 on the game for 111 yards. The Cats also racked up a handful of costly penalties, including back-to-back personal fouls that led to a Penn State touchdown. These penalties aided Penn State in scoring 14 unanswered points to take the lead in the fourth quarter. Mitchell missed two field goals and an extra point before his game-winning kick. Though NU was able to counteract the repercussions of their own mistakes, a sloppy second half raises questions about consistency. Despite losing its starting quarterback, NU was able to battle back from a deficit and perform under pressure, showing both depth and grit.